Wedding flowers. We think about the perfect look, we take all the photos, and then after the ceremony what happens? We throw them away? We attempt to preserve them in kitty litter? We send them off to be freeze dried only to spend the rest of our marriage dusting them off on a weekly basis? Traditional wedding bouquet preservation leaves a lot to be desired. Why not consider hanging them on your wall as a piece of botanical art? The gallery below is a sampling of my custom wedding bouquet preservation pieces. 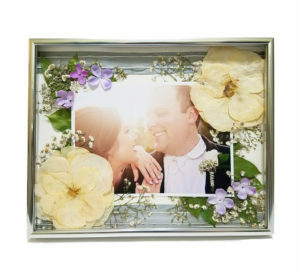 Each one was created with the actual flowers from my clients’ weddings, mementos, photos, vows/lyrics that are meaningful to the couple, or whatever else they wanted to include. Like every bride, every finished preservation is unique. 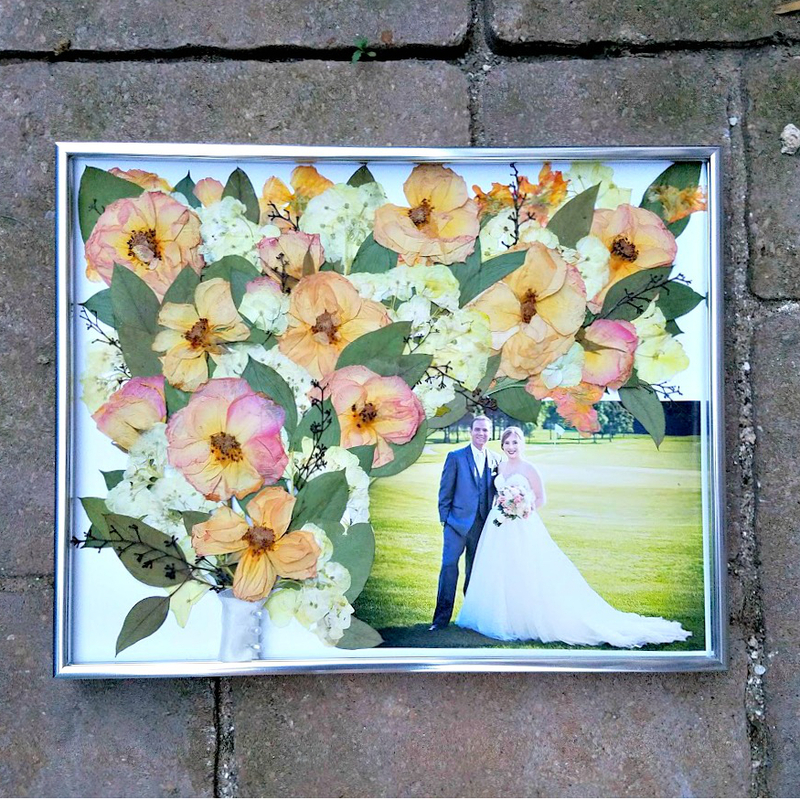 I work closely with each of my clients to design the perfect bouquet preservation for them. Ideally, we will have a plan in place before your wedding day, so you know exactly what to do with your flowers when the event is over. 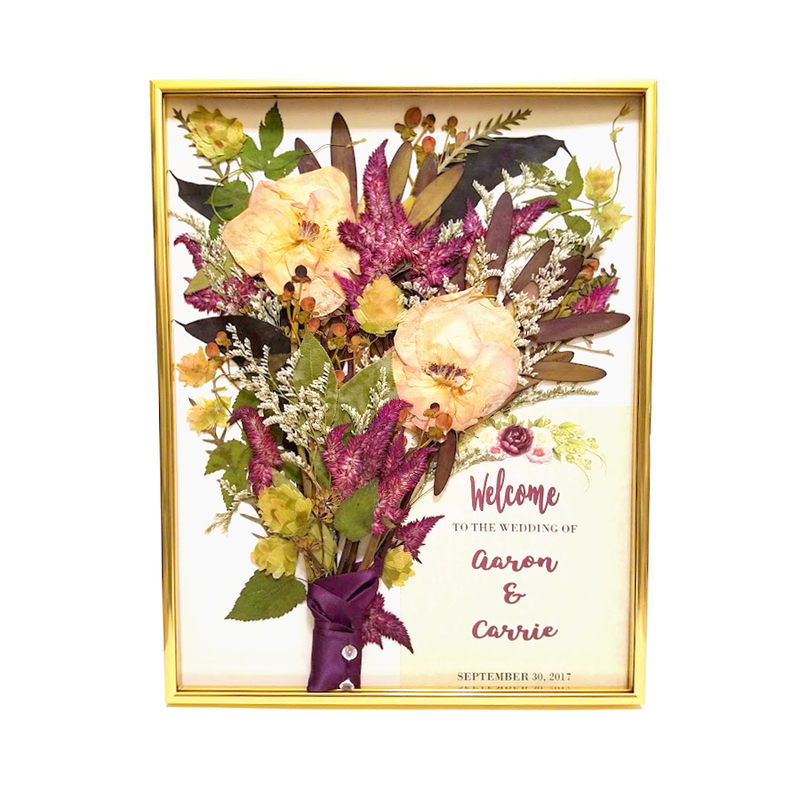 When you purchase this service I will reach out within 24 hours to provide you details for packing and shipping your flowers as well as a shipment address. 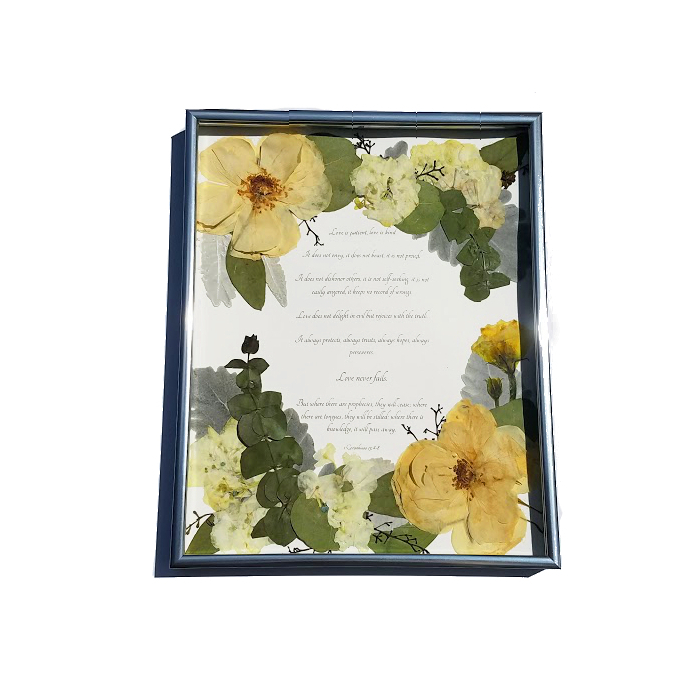 You’ll be able to have all the packaging materials on hand to ship your bouquet to me on Monday for best results. If it is already the Monday after your Saturday wedding, never fear, it is not too late to buy! Be sure to keep your flowers in water and in a cool location (but do not let them freeze!) and check out my guide to shipping flowers. Although flowers do have a shelf life (and the sooner I receive them the better the final result) I have had good luck receiving flowers as late as as 5 days after the event. Once I receive your order and your flowers they will be put into my botanical plant press to dry. 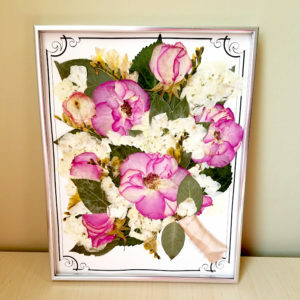 Depending on the flowers in your bouquet* the drying process will take 2-3 weeks. Once dried, I will contact you to start customizing your preservation. You will be involved throughout the process and will always get final approval for a design so you will know exactly what to expect when you receive your finished piece in the mail. Like all my work, the flowers will be preserved with UV protection to resist color fade and deterioration and the shadowbox frame is finished with 99% UV resistant acrylic, but like all art, care should be given to keep the piece out of direct sun. Please contact me if you have any questions before purchasing. I look forward to working with your ideas! If you are ready to buy, please click here to be directed to this listing in my secure square online store. 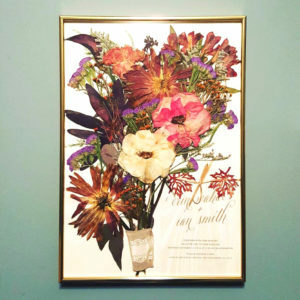 You will be able to specify size and frame color when you purchase. My preservation technique is best suited to garden flowers and greens: succulents, air plants, orchids, protea, and other thick, juicy, exotic tropical flowers do not always survive the preservation process and are not recommended for this procedure. If you have a bouquet that features these florals, I recommend looking for a freeze drying preservation artist and not a pressed flower preservation like I offer. If you are unsure about your bouquet please ask! I am always happy to talk with you about the process so we can both be sure you will love the final product. Use the form below if you have any questions.